The nine mile long inlet boasts some of the finest scenery in the West of Ireland, and because of its sheltered nature, its waters are always calm. Our purpose built cruise ship, which can accommodate up to 150 passengers, has been designed to offer the maximum of comfort and safety to our guests, and also to offer them uninterrupted views of the spectacular scenery which makes the Killary such a unique place to visit. 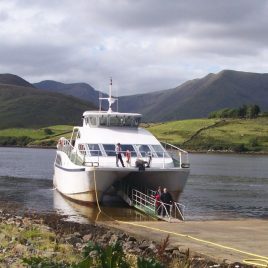 Our vessel The Connemara Lady is wheelchair accessible and is very suitable for young and old alike. We also offer a no sea-sickness money back guarantee! We are just West of Leenane in Connemara – on the border between Galway and Mayo. The journey to us will take you through landscapes of breathtaking beauty.